Throughout history, there has been a strong cultural connection between reproduction and the moon that is preserved to this day in human languages. 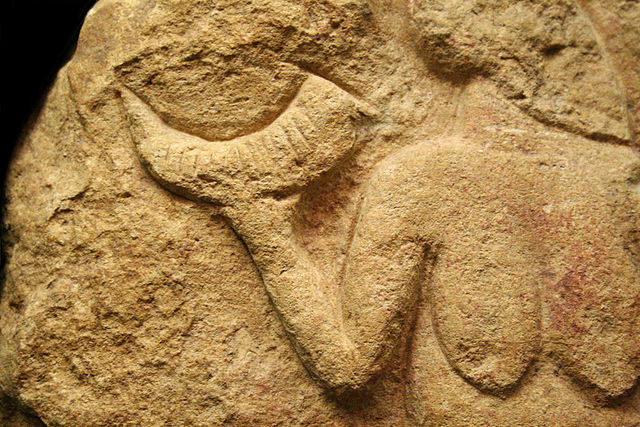 Menstruation and menses have common roots in Greek and Latin, due to beliefs about the moon that likely emerged long before human civilization. Engravings on bones and artwork from the Upper Paleolithic Era, a segment of the Stone Age characterized by increasing diversity of preserved artifacts, hint that humans noticed that the duration of the synodic month (also known as the lunar month or lunation) and menstrual cycle both lasted about 29.5 days, and thus probably assumed a connection. A beautiful example is The Venus of Laussel (La Femme à la Corne). Discovered in France in 1911 and dated to 25,000 years ago, it shows a woman with features archetypal of fertility and a horn with thirteen notches that could represent the moons or menstrual cycles of a year. Is there a biological connection between menstruation and the moon underlying the cultural beliefs? It is tempting to think so, given that the typical menstrual cycle in humans is in the range of 28-29 days, just slightly shorter than the 29.5 days of the synodic month. Some women, in fact, may experience cycles in the range of 29-30 days, thus corresponding to to lunation even better. But the message from science is that such timing is coincidental. The variation in cycle length among women is by no means as tight as one or two days. Among human women, cycles range from as short as 20 days to as many as 40 days or more. Very long cycles are typically the result of a medical problem, but a cycle in the range of 30-35 days can be consistent with the absence of pathology. There is also the matter of other species that shared a recent evolutionary history with us. Chimpanzees, our closest living relatives, have an average menstrual cycle of 35 days (with some variation as with humans). Looking at nature, there is no reason to have the same hormonal cycle that we have for the procession of lunar phases. Nevertheless, the long history of assuming the two phenomena to be physically related — along with the tendency of the human mind to make significance out of coincidence and to ignore when precision measurement demonstrates that the coincidence is not even there — has led modern people to speculate that female hormones could be controlled through changes in gravity or nocturnal light levels associated with lunar movement. But science has not demonstrated any lunar and menstrual synchrony that is statistically valid and repeatable. While light patterns do affect the dynamics of a hormone called melatonin, the interaction between various hormones in the body is quite complex, so the design of experiments to test the idea is problematic. As for changes in gravity connected with the moon, there are numerous phenomena pushing and pulling on body tissues, changing the direction and patterns of mechanical force on a scale many orders of magnitude beyond what the moon does. Handstands, handsprings, and somersaults are good examples, as is weightlessness in spaceflight, which, like lying in bed at night, does not alter menstruation. 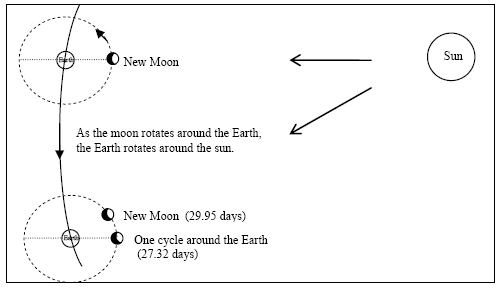 Furthermore, the gravitational influence of the moon over a particular spot or person on Earth changes, not over the course of a month, but over the course of just one day as Earth rotates. That’s why there are high tides twice per day. Overall, there is little reason to suspect that any similarity in timing of lunar cycles and human menstrual cycles is anything more than a coincidence. Colonization of the Venusian Clouds: Is 'Surfacism' Clouding Our Judgement?